You can take steps toward conserving migratory birds. Here's how to get started. Citizens can influence local and national policy to conserve songbirds in several ways, but the first step is to educate yourself. Many excellent resources are available that explain the status, habits and conservation of neotropical birds. Learning about issues relating to migratory bird by joining a local conservation or birding organization. You can receive publications that will keep you informed of current environmental issues, important seasonal bird information, and explain how you can influence pending legislation. Making donations is crucial to private conservation and birding associations. Your financial assistance to local and national organizations support their ability to publish information about conservation issues, initiate and continue valuable research projects, acquire land to create wilderness preserves, and to provide government with an understanding about issues that are of importance to each group. Nearly three-quarters of the land in the United States is controlled by private landowners. Quite literally, the future of migratory bird populations depends on private landowner's actions.While few private landowners have large tracts of undisturbed forest, many have a small grove of trees or a few shrubs in their backyard. These areas can be significant to the survival of migratory birds, especially in urban areas, which often lack the minimal habitats that birds require for migratory stopovers, periods of rest and refueling. With considerate landscaping, foraging habitat for migratory birds can be created in even the smallest backyards. Here are some ideas for providing backyard habitat for migratory birds. Exactly what you can do depends on the size of your property, your budget, and personal preferences. Keep in mind that the widest variety of natural elements will provide resources for the greatest number and variety of birds. 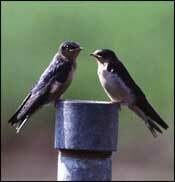 Birds require food, water, shelter, and nesting habitat for survival. They must also be protected from backyard dangers. The types of foods that migratory birds requires vary according to the seasonal energy demands of migration, raising young, and molting. The birds begin to arrive in North America just as the first generation of spring caterpillars begins to nibble on the newly unfurled tree leaves. These tiny larvae, full of protein and water, become a major food source for birds during their stay at the breeding grounds. A pair of warbler parents can remove caterpillars from thousands of leaves in the ten days it takes to fledge a nestful of young. In fact, a recent study documented that if the birds were excluded from an oak sapling with a wire cage, the tree lost about eleven percent more leaf area to caterpillars than if birds were allowed to forage there. Berries are an important source of carbohydrates and fats in the diet of migratory birds. In the northeastern United States alone, nearly one hundred native plant species produce these small fruits. One group, the wild grapes, provides weeks of nourishment for more than fifty species of birds. Migrants rely on berries most heavily on the late summer and early fall. Some berries stay on the bush all winter, providing emergency rations for returning migrants in the spring and cold winter days. Provide a wide variety of fruiting and flowering plants. Chose plants that vary in structure, type of foods produced, and the times at which food is available. Choose plantings so that the flowers and fruits will be available to migrants from their arrival in early spring through their departure in late fall. Plant trees and shrubs that attract an array of insects. Plants such as cottonwoods, maples and junipers are an excellent source of insects and fruits for avian feasts. Grow native species whenever possible; they are often best adapted to local soils and climates and require less fertilizer, water and pest control. Native plants can be obtained through local nurseries or plant catalogues. To ensure that these plants are suited for your property, have your soil tested, even over a small area the soil's pH, or acidity, may range widely. Contact your state's cooperative extension for assistance with soil testing. Design clusters of plantings, mixing the variety of plant species and forms. Always put larger plants in the back of the cluster to prevent them from shading out smaller plants. Take into account the amount of light each plant requires, the size it might reach at maturity, and the time it needs to reach maturity. Reduce the amount of lawn on your property by replacing your lawn with plants that provide food for birds. Lawns are of limited value to wildlife and, in urban areas, they are the largest consumer of water, fertilizers, and pesticides. For drinking and bathing, birds use water from a variety of sources as large as a lake or as small as a puddle. Does your property offer a constant supply of clean water for birds? If not, several simple and inexpensive methods of creating a water source for birds exist. Commercial birdbaths are available in numerous styles, or you can easily make one by placing a shallow (less than two inches deep) dish filled with water on a tree stump in a shady location. Remember to keep the water clean. Regular scrubbing is required for heavily used baths. Create a small pool using a fiberglass pond or by digging a hole and lining it with a suitable rubberized or plastic liner. If you have the space and are willing to invest some money, hire professionals to add a large pond to your landscape. Birds need shelter to escape predators, such as hawks and cats. Shelters can also protect birds from harsh weather. Birds often take refuge in dense thickets of plants, such as brambles, hollies, and viburnums. Establishing shelter for migratory birds is an easy but vital task. Provide cover for birds by planting shrubs and evergreen trees. Use landscaping scraps to create a thick brush pile of branches or a meandering rock wall. Disperse several sources of cover throughout the entire yard. Finding adequate habitat to raise their young is becoming increasingly difficult for migratory birds. 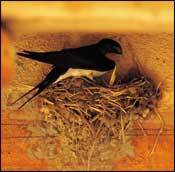 Migratory birds vary widely in the type of habitat they require for nesting. Most of the species that seem to be declining require large tracts of forest or grassland. Still, backyard habitat remains important. A good backyard habitat may encourage hummingbirds to nest in shrubs, phoebes to nest under the porch eaves, or a woodpecker to nest in the hollow of a dead tree. One of the most valuable contributions a private landowner can make is the protection and management of trees. Trees are a major source of insect prey for migratory birds, they are the seed banks of our future forest, and they provide nest sites for birds. Trees may be physically damaged by harsh weather, vandalism, neglect, improper pruning, construction, or over-browsing by deer. They can fall victim to numerous viruses, fungi, and blights, or have their roots damaged by the erosion or compaction of soils. Not all dead trees are bad trees. Snags offer nest sites to a number of cavity nesting birds, such as: Northern Flickers and White-breasted Nuthatch, and rotting wood attracts insects that numerous other bird species consume. Employ a reputable tree care company to regularly inspect and manage the trees on your property. Discourage tree vandalism and unchecked populations of deer. Having invited migratory birds into your yard, you have a responsibility to protect them from hazards associated with the human community. Stanley Temple and John Coleman of the University of Wisconsin calculated that free-ranging rural cats kill as many as 150 million songbirds annually. They estimate that birds make up 35 percent of a free-ranging cat's diet. While some view this as an overestimation, domestice cats are widely recognized as significant predators of songbirds. Many people believe that a collar bell will alert birds to danger, but research shows that cats either sit and wait for their prey or stalk very slowly. By the time a bell rings, it is too late. Research has also shown that declawing a cat does not prevent it from killing wildlife. Cats should be either confined indoors or be restricted to a fenced area. Project Feeder Watch, run by the Cornell Laboratory of Ornithology, has collected data suggesting that at least 100 million birds die each year in collisions with windows, and Daniel Klem, a researcher at Southern Illinois University who has studied window kills extensively, estimates that 95 to 950 million birds are killed annually when they strike reflective windows. If birds are colliding with your windows, break up the reflective qualities of glass by rubbing soap over the surface to create a dull appearance. Other options are to install screens or hang a couple of streamers or objects on the window, or mount plastic garden protection netting on a frame installed approximately one foot form the glass surface. Birds that hit the screening will bounce off unharmed. Several commercial establishments sell falcon silhouettes, claiming that the image warns birds away from the window. Research has shown that these silhouettes are ineffective unless a number of them are used together. When they work, it is because the pattern of images breaks up the reflection on the glass, not because the birds are scared by the falcon image. Countless birds die each year from direct contact with landscape and agricultural chemicals (from eating pesticide granules or being sprayed) or indirect contact (from eating poisoned prey). In your yard, reduce your dependence on chemical fertilizers and pesticides by cultivating native plants and reducing lawn area. Control pest insects by setting out pest-specific traps, interplanting species that repel insect pest, and increasing natural insect predators, such as lacewings, ladybird beetles, toads, and the birds that the garden was intended to attract in the first place. Use leaf and compost mulches to add nutrients to the soil. Refer to books on natural organic gardening and let your garden go wild.